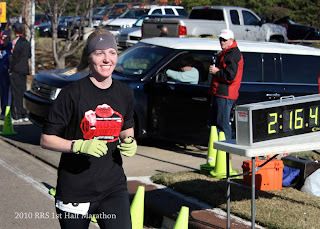 I had a new half-marathon PR at this race with 2:16:12. Didn’t realize it until the next day or so. Couldn’t remember if I did 2:15 at the 2010 Germantown Half-Marathon or 2:20. The MRTC Holiday Party is great. I paid $15 and went as Bobby’s guest last year. He got in free, of course, because he ran the Road Race Series. There is delicious salad, different kinds of pasta, garlic bread, cooked veggies and lots of desserts. Also, beer is free (you must pay for wine and mixed drinks). Advice: Jump in that beer line first thing and grab yourself 2 beers at a time, as well – the beer line gets very long. Don’t forget that if you did at least 6 RRS races you get a finshers item (last year was a laptop) bag. If you were a Road Warrior and did all 10 RRS races you get a very cool trophy and an even better item (last year was an even nicer laptop bag). Awards for the series will also be given out that night if you were especially fast in your age group. Finally, the best part is seeing all your running buddies! Last year I only knew Bobby, Nathan and Brett. This year I’ll know LOTS of people, so it will be quadruple the fun! Bethany, I'll be thinking of you guys Saturday racing! Good luck! Previous Previous post: Grizzlies House 5k – FULL!